Try for yourself accessing catalogue sections and user defined library of profile curves to be swept parametrically in Grasshopper. For present, the function is accessed as a c# or vb.net component, and links to a profile section table embedded into a parent Rhino document. If you update a section profile, you must instruct Grasshopper to recalculate (unless a user modification triggers a recalculation). There's lot's of planned ideas and improvements to make to this, it's just the beginning (Options for not generating member cap surfaces, root radius fillets etc). If you have any ideas or suggestions, please let me know and I'll try to implement ASAP. This includes requests for any specific aspects included in the BullAnt plug-in or SSI model exchanging tools. Ensure you have downloaded the latest version of the BullAnt plugin from http://www.geometrygym.com/downloads for this to work, and you must have a valid approved license file (free trial) installed on your computer. Simply Rhino SA is hosting another Rhino User Group meeting in Cape Town. Jon Mirtschin of Geometry Gym Ltd. will present on utilising Rhino3d for geometrical modelling primarily for architecture and structure. Techniques used to model projects such as the 2012 Olympic Velodrome, Infinity Footbridge and Beijing Watercube will be demonstrated. 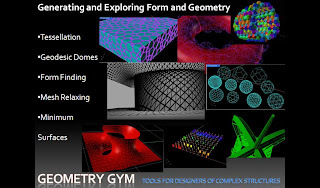 Innovative tools for geometric modelling including geodesic domes, minimal surfaces, mesh relaxing, tessellation and parametric steel frame modelling will also be featured. If you are interested in this presentation but unable to attend at this time, or are located in another part of South Africa, please contact Jon at jonm@geometrygym.com to discuss the possibility of meeting.